Each year, K and I plan the most extravagent birthday parties. Surprise trip to Vegas, surprise trip to Yosemite, beach bbqs in Carmel, etc. 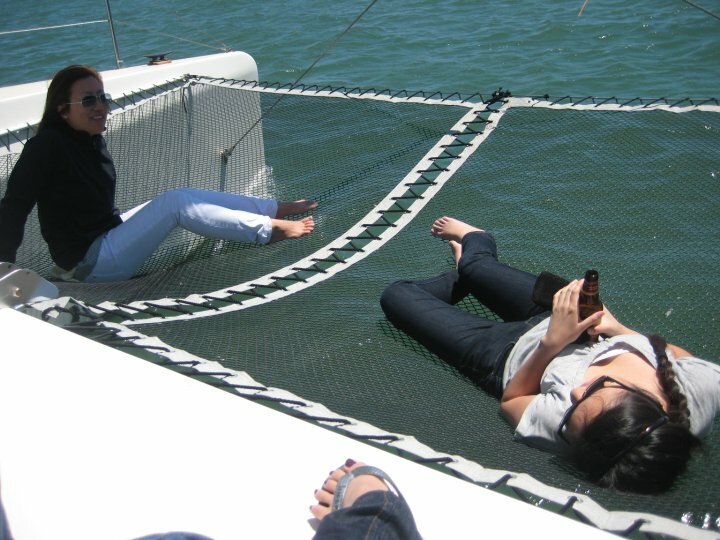 Well this year, I topped it off with a catamaran ride in the Bay! I was praying for great weather, and lucked out into get the warmest day in May, though a tad bit windy. More about the trip after the jump. The hardest part about planning this event was picking a catamaran. I initially called the AdventureCat, which offers 1.5 hour public boat rides for $30 (adult), to see if they had any small charters available. Ideally, I was looking for a boat that could hold 20 people. Of course, they didn’t. They do, however, have private rentals for 45-99 guests and I assume the cost would empty one’s bank account. My company rented one of these large charters for one of our company team-building events followed by tequila tastings in Sausalito. You can imagine how that went. Anyway, AdventureCat recommended the Apparation with Capt’n Stan (really it’s Captain Stan, but I like the sound of “Capt’n” better). He seemed to have the best deal out of every catamaran rental I called. His boat holds 13 guests and we were able to bring our own food and drinks. We brought sodas, beer and pb&js. Capt’n Stan was incredibly easy to work with. I was concerned about weather since San Francisco has been having odd weather patterns, like rain during the week and 70 degree weather on the weekends. He assured me not to worry and let me know we could reschedule if weather permits. 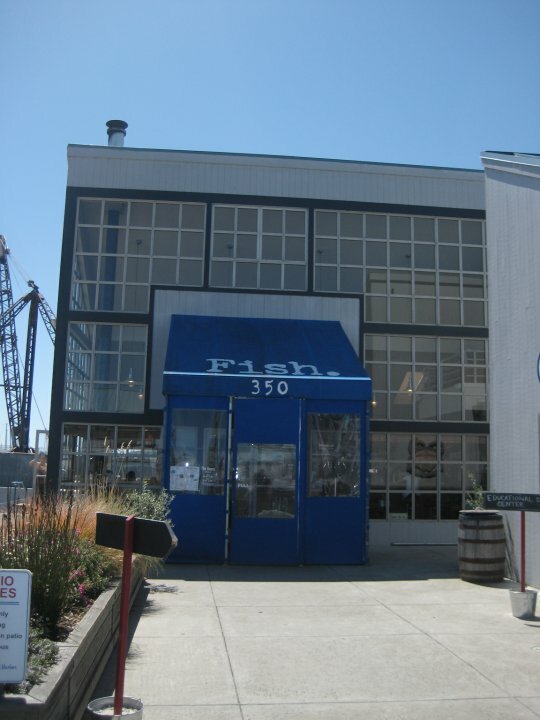 We started the day at Fish. in Sausalito. I’d give it about 3 clubs, but a full review will come soon. 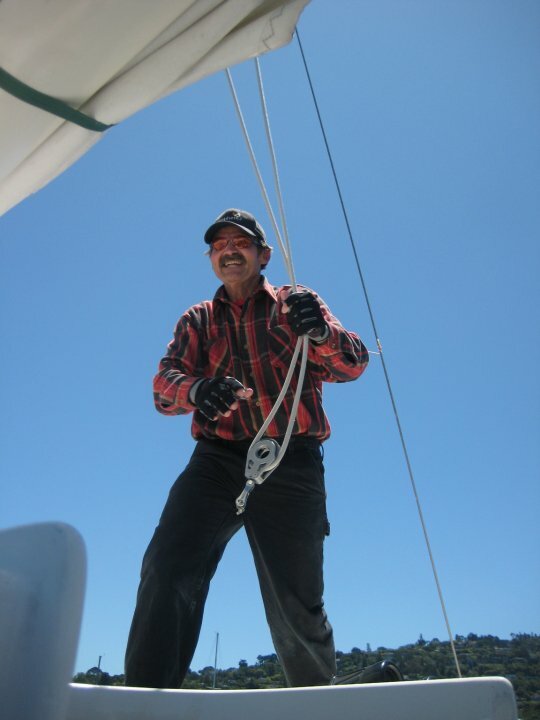 We boarded in Sausalito in Schoonmaker Point Marina. Make sure you plan to arrive early because you will get lost trying to find this place. Something about “drive towards the palm trees” gets a little confusing. Capt’n Stan and Sandee were very sweet as they took us on our 3 hour boat ride around Alcatraz, Angel Island and Tiburon. Although, they’d probably take you anywhere you wanted to go. The ride is incredibly smooth, virtually no rocking at all because of the way the boat is shaped. The ride was so relaxing, nearly half of our party were taking naps, including myself. 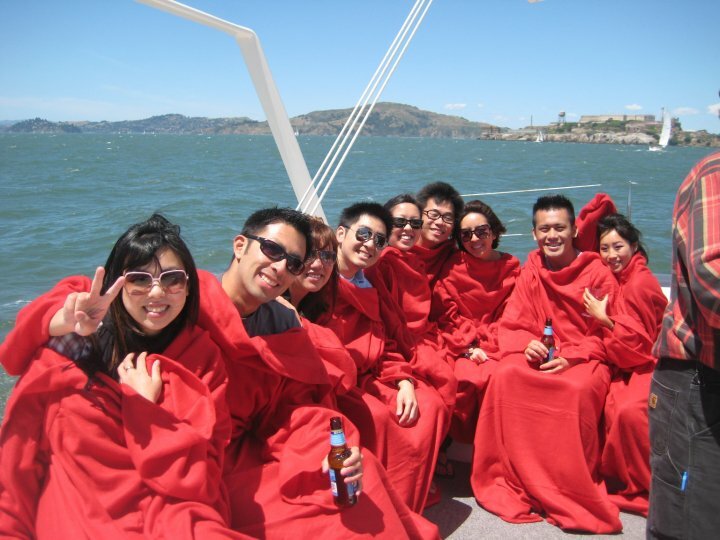 It did get breezy once we hit San Francisco, so thank goodness K bought everyone snuggies (in cardinal red) to keep warm! I had a blast on the Apparation, and I’m excited to rent it out again, possibly for my own birthday. 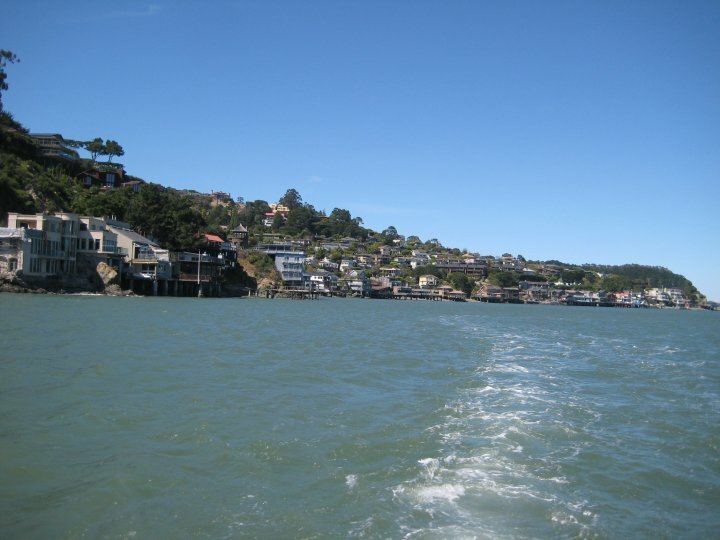 Next time, I’m thinking about chilling in the Bay right off of Tiburon for the whole 3 hours. That was REALLY fun! Let’s do it again some time!! !